A look at how drastically our climate has changed, why we haven’t really noticed, and recent climatic events. Climate change is easily overlooked. It has been a gradual, rather than a sudden change. Since the average weather changed over decades rather than overnight, it makes sense that most of us haven’t really noticed a difference like the boiling frog story. And for many of us, especially younger people, we’ve never experienced weather that wasn’t affected by climate change – much like the fish who don’t realize they’re in water. Shockingly, if you are 33 or younger you’ve never experienced a cooler-than-average month compared to 1950-1981 temperatures. This baseline is even a bit conservative. If you were to use 1881-1910 temperatures, you’d have to be over 53 years old to have lived through a cooler than average month. We’re changing the temperature at a rapid pace. According to a Stanford study that looked back 65 million years, temperatures are changing 10-100 times faster today than at any time since the dinosaurs. By burning greenhouse gases (GHGs) for the last 250 years we’ve changed the physical composition of our atmosphere. We’ve changed the climate of the last 12,000 years in which the agricultural revolution took place, the first civilizations appeared, writing was invented, and all the major religions were started. We made crucial, climate-dependent decisions, such as choosing safe places to live, under the assumption the climate would remain stable. But the stability of Earth’s climate is not something you can take for granted – which is now clear based on how drastically we’ve changed it. Due to this rapid temperature increase, it makes sense that we shouldn’t expect the weather to be the same as what we’ve always known it to be. The historical probabilities we used to rely on for weather no longer apply. Not only are our average days and months hotter than they used to be, but we are now seeing what used to be incredibly improbable, extreme weather events more and more often. And they’re more intense. For you statistic wizards out there, this bell curve shows how the normal distribution of summer temperatures has changed over the last 6 decades in the Northern hemisphere (NASA data). For the rest of us muggles, you can think of our daily weather like rolling a pair of dice. Each die is numbered 1 to 6, so when rolled the sum is between 2 and 12. As you can see in the “Historical Odds” table, we will either get a cooler-than-average temperature (rolling 2 to 6), an average temperature (6 to 8), or a hotter-than-average temperature (8 to 12) depending on what is rolled. Each happens 33% of the time* using the baseline data from 1950-1981, which we’ll call the “Historical” Odds. *To make this work mathematically, 60% of the 6’s and 8’s rolled would count towards “Average” temperature, 20% towards “cooler than average”, and 20% towards “hotter” than average. These tables were put together using NASA’s data as a starting point. The dice analogy is taken from them too although it has been tweaked and extrapolated to make it a bit clearer conceptually (IMHO). The tables highlight how daily weather has changed, and continues to change, as a result of climate change. But we don’t actually play with these “Historical” odds anymore. Humans have completely changed the odds by emitting greenhouse gases (GHGs) into the atmosphere and causing the climate to change. Check out the “Current Odds with Climate Change” table above. Our weather is way different from what it was just a few decades ago. It’s as if we loaded the die so that higher numbers are rolled more often and we drew some extra dots on the dice so that we can now roll higher than a 12. This means that what used to be considered “hotter than average” is now our “average weather”. We have more or less created a new category of “incredibly rare heat” which we reach 6,410% more often than we used to. If that weren’t bad enough, we continue to load the dice towards higher numbers every day. We will ultimately determine how high the numbers get based on how much more GHG emissions we put into the atmosphere. Is climate change the sole reason for all of the natural disasters we have witnessed recently? No, it is not the sole reason. It’s hard to attribute any one specific event to climate change because there has always been extreme weather. But has climate change increased the frequency and intensity of extreme weather? Absolutely. Would we be seeing so many “rare” and devastating extreme weather events in recent decades if climate change weren’t happening? No shot. 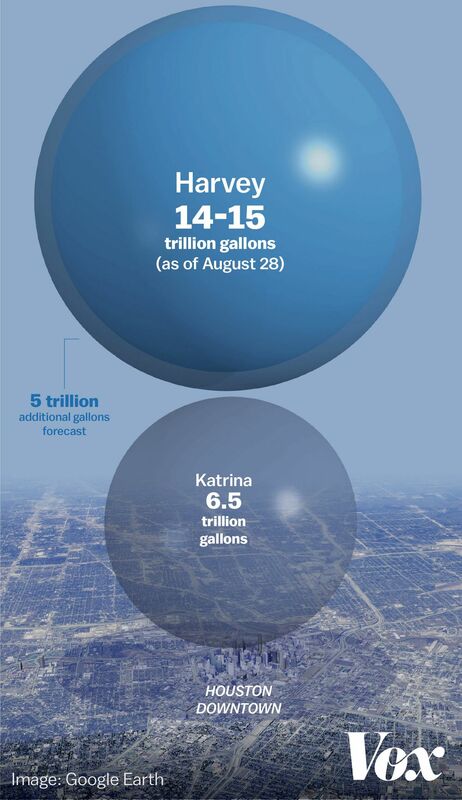 Houston, Texas faced devastating storms 3 years in a row. Each of these storms was only supposed to happen once every 500 years. Pre-climate change odds of this happening: ~ 1/125,000,000 (.000000008%). Harvey was especially damaging and dumped record-breaking rains (over 4 feet) on Houston. Click here for a visual of how much rain that is. Hurricane Irma set various records including sustained wind speeds of 185 mph for 37 hours straight. It was about the size of France or Texas. Hurricane Maria ultimately killed 4,645 people. It forced hundreds of thousands of Puerto Ricans to flee to the US mainland. Six months after the event, 200,000 people on the island still didn’t have power. Louisiana loses a football field’s worth of land every hour and is home to some of the first people being forced to leave their homes in the US (Alaska too). The 4 million people in Cape Town, South Africa nearly ran out of water in the Spring of 2018 due to a three-year drought. Had “Day Zero” come to pass the city would have shut off the taps. Citizens would have lined up at 200 stations to get their allotted 25 liters (6.5 gallons) of water each day. Perspective: the typical American uses 340 liters of water daily. The average shower uses ~65 liters. Pre-climate change odds of so little rain in 2016 and 2017: ~ 1/1,150 (0.09%). ~ 24-150 species become extinct each day as we’re in the midst of a mass extinction. Extinction of species is occurring at 1,000 to 10,000 times the natural rate. To put this in perspective that’s like ⅔ of the US population (every person living in a state other than CA, TX, NY, and FL) being forced to leave their homes at some point in the last decade due to dangerous climatic events. Or 90% of Australia’s population being displaced every single year. According to NOAA the number of $1 billion extreme weather events is up 400% since the 1980’s. 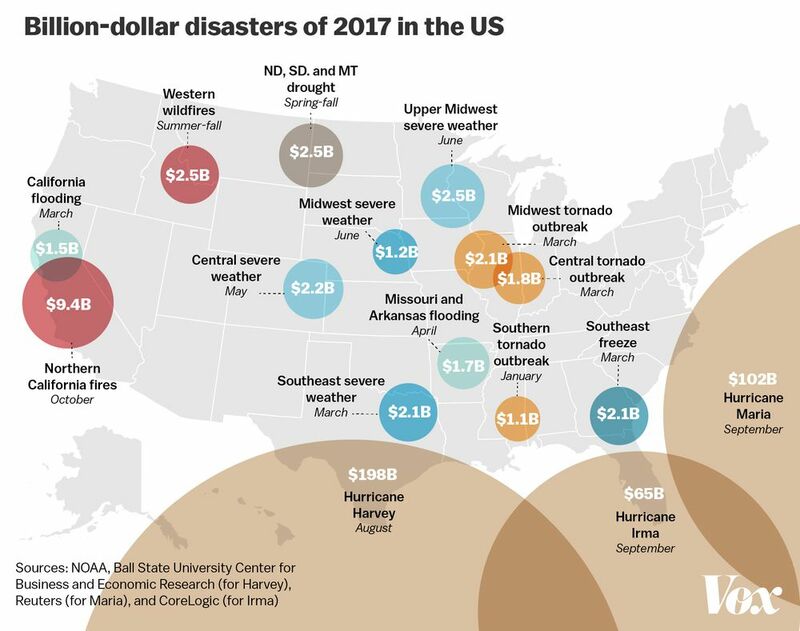 $306 billion in damage from natural disasters in 2017 set a US record. That’s enough money to send all 13.5 million US students enrolled in public universities to school tuition-free for 4 years. I focused mainly on the US here, as that’s where I’m from and where most of my readers will be from to start. Please keep in mind the US covers 2% of the earth’s surface and our news hardly spends any time informing us of the happenings in the rest of the world. Crazy stuff is happening everywhere. Do you know anyone who has been affected by climate change yet? If not, you surely will soon. Read part 3 of this series to see where we stand today in our efforts to reverse climate change, the chances that we’ll stay under 2°C, and why 2°C matters in the first place. We Do Not Have Climate Change Under Control. A Sense of Urgency is Needed! Climate Change is the Biggest Threat Humanity Faces Today. It Unquestionably Affects PEOPLE.